Batman #13 is the first comic book I’ve read in a long time to actually put me in a bad mood. I was literally snapping at people after I finished it. I don’t know if I’ve ever read a single issue that was so suspenseful, so well crafted, and that hit all the right notes so perfectly, only to botch the payoff in such a catastrophic way. 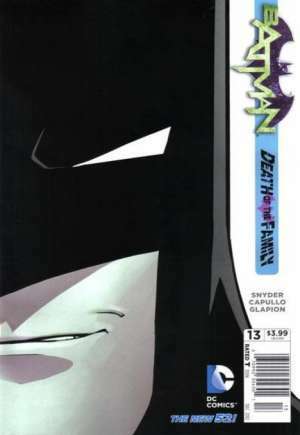 Batman #13 is the first issue in the Death of the Family storyline that will spread across most of the Bat books for the next two months. It also marks the first time we’ve seen the Joker since Detective Comics #1 last September, when he willingly had the skin on his face removed by the Dollmaker. In this issue he returns to Gotham City, terrorizes Commissioner Gordon, murders numerous police officers, and announces his intention to kill all the member’s of Batman’s surrogate family one by one. His first target: Alfred. That’s right folks, he’s going there. What fans have long speculated has become reality: The Joker (apparently) knows Bruce Wayne is Batman, and the gloves are coming off. 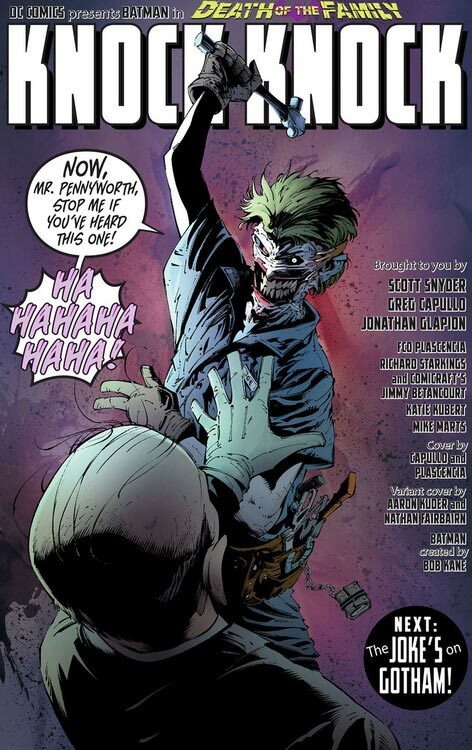 The issue’s main story by Scott Snyder and Greg Capullo is flawlessly built up to a full page reveal where we not only see Mr. J attacking Alfred with a hammer, but we see his new face for the first time. Believe it or not, it’s the same as the old one. Only this time, he’s stretched his old skin out across his head like a Leatherface-style flesh mask. This shocked me…and not in a good way. Indeed, Snyder and Capullo go full on suspense/horror flick in this issue. Up until the Joker’s reveal, it was working beautifully. They set the mood with a rainstorm, and throw in some signs of the apocalypse metaphors. Then on page 4 we get a beautifully framed long shot of our villain simply standing in a doorway at Police Headquarters, his face shrouded in darkness, while his body is clad in seemingly average repairman clothes. Then he cuts the lights and taunts Gordon, all the while snapping the necks of the other cops in the room. All of this is a wonderful play on humanity’s fear of the unknown. In this scene, not only do we get a crazy person put in the room with us, not only can we not see the crazy person, but we have no idea what the crazy person even looks like anymore! One by one, our safety nets are cut out from under us. It’s a fantastic scene. Later, we see some classic Joker elements mixed with Snyder and Capullo’s horror formula. We see the Joker cut into broadcast television and do some murderous comedy. Then we see the “I’m going to kill an important person at midnight” routine, which actually dates back to the Joker’s original appearance in 1940. We go back to the Ace Chemical Plant, where the Joker was born. Capullo and the artists turn it into a delightfully rusted and worn setting, in which you can almost hear the creaks and squeals of old metal. These elements all add up to a “what’s the psycho going to do next?” vibe that’s synonymous with some of the best Joker stories ever told. Snyder also keeps the Joker’s sense of humor intact, which has an unparalleled importance in terms of getting the character’s voice right. In this issue we see the both the artist and the anarchist. But the Leatherface mask ruins all of that by pushing the Joker too far in the horror direction. That balance between performer and killer is gone now. On that last page he looks more like a three-way mash up between Leatherface, Pennywise the Clown and The Cable Guy. To an extent, it actually makes him look like more of a generic slasher movie character than the most thrilling villain in all of comics. 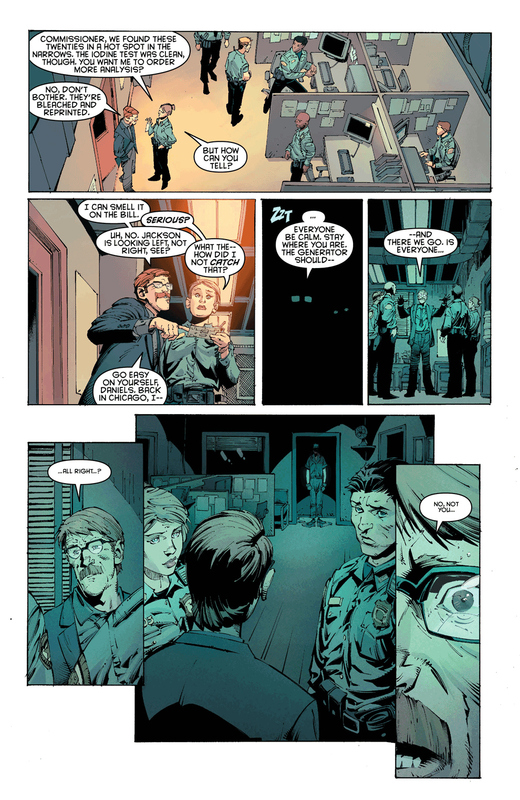 When they had the character lose his face last year, the implication seemed to be that he would indeed come back with a more horror-leaning look, perhaps even something akin to what the Dollmaker looked like in Detective Comics. To me, the move was an extension of what Grant Morrison did with the character during his run on Batman. The alternate font in the word balloons, the forced smile akin to Conrad Veidt in The Man Who Laughs, etc. But from a character standpoint, why go to the trouble of having someone surgically remove your face if you’re simply going to steal it back? I understand we’re dealing with a character who defies conventional logic, but that’s a question Snyder will need to answer. Image 1 from newsarama.com. Image 2 from comicvine.com. This entry was posted in Comic Books/Graphic Novels and tagged Alfred Pennyworth, Batman, Batman: Death of the Family, comic books, Commissioner Jim Gordon, DC Comics, Greg Capullo, Harley Quinn, James Tynion IV, Jock, Leatherface, Pennywise the Clown, Rob Siebert, Scott Snyder, single issue reviews, The Cable Guy (1996), The Dollmaker, The Joker, The Man Who Laughs (1928) on 10/10/2012 by primaryignition.